Love it! 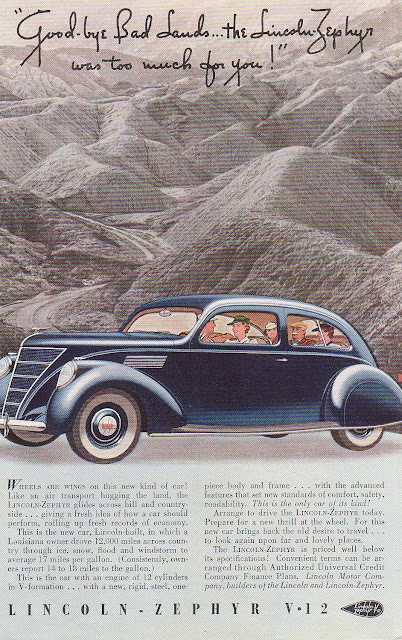 What class…Not too economical or ecological, yes, but ya gotta admit they sure knew how to make cars back then! Interesting conceit too. The car defeated the badlands. If I drove through them successfully today in a much superior car, I’d merely think it “survived”… Is that a sign of the times? Then and now? um, maybe? War looming on the horizon of history, everyone needing to feel powerful? Dunno. We read a lot of history but it can sometimes be hard to capture the spirit of a time around the events in it.